Dr. Potter is a native of Fort Washington, MD, and attended Columbia University where he earned his B.A. degree in 2000 with dual majors in Pre-Medical Studies and Art History. In 2006 he graduated from Howard University College of Medicine and completed his internal medicine residency at Howard University Hospital before pursuing his rheumatology fellowship at New York University. Between medical school and his internship/residency, he spent a year at the National Institutes of Health as a recipient of an Intramural Research Training Award. Following his fellowship, Dr. Potter was appointed to the Rheumatology faculty at the University of Virginia and served as Assistant Clinical Professor from 2013-2016. There, he helped to establish a curriculum for musculoskeletal ultrasound for training fellows and gave several presentations on topics including rheumatoid arthritis, inflammatory myositis, and systemic lupus erythematosus. He participates annually as a question writer for the American College of Rheumatology’s Continuing Medical Education Program (CARE). He was invited recently to speak about patient-physician interactions for the Lupus Foundation of America. 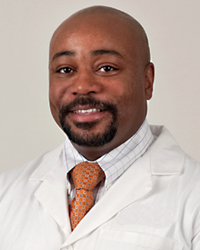 Dr. Potter has received multiple scholarships and awards throughout his academic and medical careers, including the ACR REF/Amgen/Pfizer Rheumatology Fellowship Training Award (New York University), Teaching Resident of the Year (Howard University Hospital), Intramural Research Training Award (National Institute of Arthritis, Musculoskeletal & Skin Disorders), Dr. Emile C. Nash Award (Howard University College of Medicine), and Internal Medicine Departmental Award (Howard University Hospital). He has been first author and co-author of several peer-reviewed articles, largely focusing on disparities in U.S. Healthcare. Dr. Potter is board certified in internal medicine and rheumatology and is a member of the American College of Rheumatology. His areas of interest include rheumatoid arthritis, gout, myositis, systemic lupus and musculoskeletal ultrasound. Dr. Potter is married to a Pediatrician (Jamila) and has two children. He enjoys golfing, cooking and traveling. Dr. Potter is seeing patients at both our Wheaton and Olney office locations.